A winter storm that dumped a few inches of fresh snow overnight caused numerous crashes across the state during the Wednesday morning commute. Maine drivers were met with a messy commute Wednesday morning after an overnight storm dumped a few inches of snow over much of the state, contributing to numerous crashes. 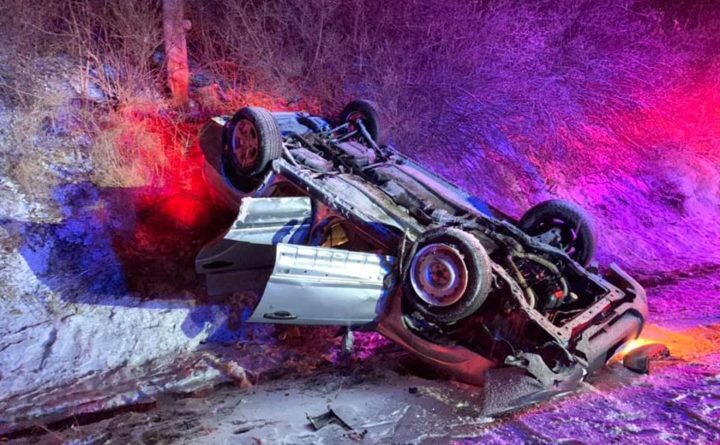 In the town of Cumberland, a driver was hospitalized with minor injuries Tuesday night after a rollover crash on Tuttle Road, according to the Cumberland Police Department. Authorities said the powdery snow on top of ice left roads slick in many places. Another vehicle crashed on the Maine Turnpike between southbound Exits 48 and 46 in Portland about 7:22 a.m., according to the Maine Turnpike Authority. That crash was cleared before 8 a.m. The turnpike authority reported another crash in the southbound lanes in Brunswick before 11 a.m., which was quickly cleared. The speed limit was reduced to 45 mph along the Maine Turnpike from the New Hampshire border to Augusta. It was later restored to normal about 11:30 a.m.
Roosevelt Trail, also known as Route 302, in Windham was closed near Hall Road about 8 a.m. after a car crash took out a utility pole there, according to the Cumberland County Sheriff’s Office. Central Maine Power Co. temporarily cut power to the area while crews worked to repair the damage, according to NBC affiliate News Center Maine. The road reopened shortly after noon. The Maine State Police reported just before 9:30 a.m. that a northbound tractor-trailer went off Interstate 95 into the median in Clinton. “If you have to be out, take it slow and be aware that conditions are slick,” the state police said. Dozens of schools across the state either closed for the day or delayed their start. Snow totals weren’t immediately available for Greater Bangor and other points in eastern Maine, but the National Weather Service Office in Caribou had forecast at least 4 inches of fresh snow for much of eastern Maine, with lower amounts expected along the Down East coast and slightly higher totals north toward the Canadian border. In Portland, about 4.8 inches of snow fell at the Portland International Jetport, with similar amounts reported in Freeport, Cumberland and Gray, according to the weather service office in Gray. To the north, Lewiston and Auburn saw 5.5 and 4.5 inches of snow, respectively. In York County, 8.3 inches of snow were reported in Acton, 7 inches in Biddeford, 7 inches in Kittery, 6 inches in Kennebunk and 5 inches in York, according to the weather service. Along the midcoast about 3 to 5 inches of fresh snow fell. The snow tapered off early Wednesday morning and came to an end by noon. The weather service warned that additional snow squalls and high winds could hit the state Wednesday afternoon and evening. That will be followed Thursday by high temperatures that drop into the low teens or single digits as a blast of arctic air blows into the state.